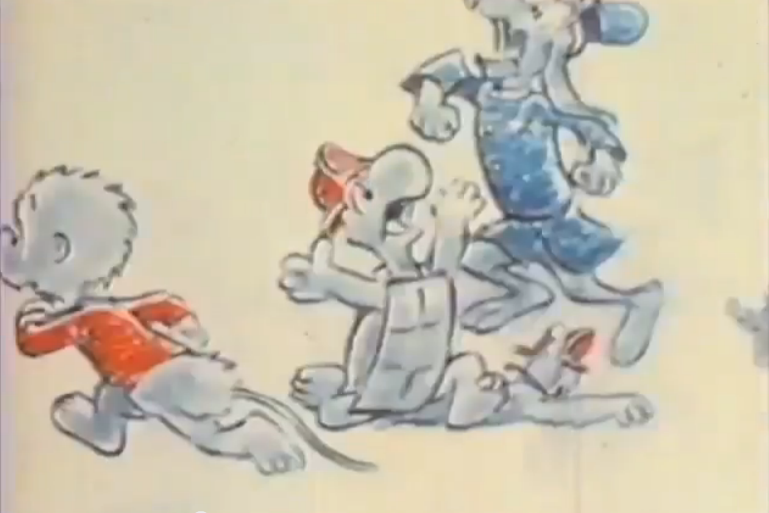 Fascinating article over at Cartoon Brew, showcasing Walt Kelly’s attempt– after a collaboration with Chuck Jones he felt had debased his characters– at animating Pogo by himself. To get this far– to do a 13-minute film when he was in failing health– Kelly had to skimp on the framerate. But he obviously hadn’t forgotten how to animate, and this is one of the very few instances of a comic strip artist animating his own work. Naturally he has no trouble staying on model. And his hand coloring looks suprisingly good. If you haven’t heard of Pogo, that’s a shame. It’s a contender for Best Comic Strip Evah, and I’ve loved it since I was a kid– I haven’t covered it over in Bob’s Reviews only because I haven’t been sure I could do it justice. I’ll have to tackle it, but not today. Edit: But today’s the day. And as a Pogo freak, I’ve been poring over screencaps of Jones’s version of Miz Mam’selle Hepzibah, trying to figure out why it looks wrong, despite it not being terribly different. Graphically, the changes are in the eyes, nose, and mouth– all in the direction of making her more human. 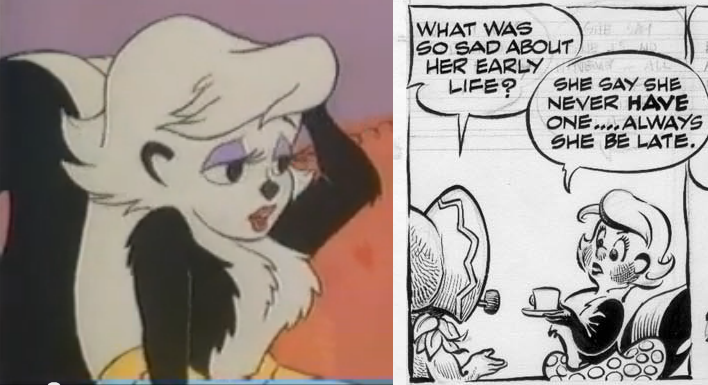 The problem, I think, is that Miz Mam’selle was already as cute, for an anthropomorphized skunk, as she needed to be. Jones has taken the character into some dimension between cutesy and disturbing.